Pearls form when a tiny particle of matter like a grain of sand finds its way into the shell of a mollusc and becomes coated over time with nacre, or mother of pearl which covers the inside of the shell, forming a pearl. Pearls range in colours, and many are dyed. Once viewed by Arabians as tears of the Gods, the pearl is thought to signify faith, charity and innocence and to enhance the integrity of the wearer, and is one of the birthstones for June, symbolising health and longevity. Unless otherwise stated, strands are all temporarily strung which means they are ready for you to add your creativity to them. Care Tips: Always put your pearls on last - after applying your perfumes or potions and lotions, take them off first when you undress. Pearls should be cleaned only with mild soap and water and dried with a soft cloth; never use harsh chemicals or ultrasonic cleaners on your pearls which are a natural product - remember, pearls need the oils naturally found on your skin to thrive and never store them in plastic bags long term or they will lose their sheen. If you string pearls on silk (as is traditional) and you wear them regularly you can reckon on needing to restring them every 2-3 years depending on wear and tear. Remember always to stretch your silk thread before stringing and knotting pearls this way. Stringing pearls on modern stringing materials like 'Beadalon' makes pearl jewellery easier to care for and less likely to need restringing as frequently. 1 Short Strand Large Cross Copper Pearls. Pearls measures approx 25x20x6mm, cross drilled at an angl..
1 Short Strand Cream Large Stick Pearls. Approx 23x8x5mm, strand measures 16.5cm consisting of..
1 Strand Pink Keishi/ Cornflake Freshwater Pearls – the pearls measure approx. 8x4mm (some smaller, ..
1 Strand Acid Yellow Rice/Oval Shape Freshwater Pearls - oval pearls which measure approx. 6x5 mm, s..
1 Strand Peacock Keishi/Cornflake Freshwater Pearls – the pearls measure approx. 10x6mm (some smalle..
1 Strand Wheat Pale Gold Keishi/Cornflake Freshwater Pearls – the pearls measure approx. 8x4mm (some..
1 Strand Grey/Lilac Keishi/Cornflake Freshwater Pearls – the pearls measure approx. 8x4mm (some smal..
FW-352, 1 Strand Gunmetal Rice Shape Freshwater Pearls approx. 7 mm. 1 Strand Gunmetal Rice Shape Freshwater Pearls, approx. 7 to 8 mm. Strand measures approx. 14 inches..
FW-334, 1 Strand Peach Potato Shape Freshwater Pearls approx. 8 mm. 1 Strand Peach Potato Shape Freshwater Pearls, approx. 8 mm. Strand measures approx. 14 inches. Grad..
FW-350, 1 Strand Pale Pink Freshwater Pearls Rice Shape Approx. 8mm. 1 Strand Pale Pink Freshwater Pearls Rice Shape Approx. 8mm. Strand measures approx. 14 inches. Grad..
FW-331, 1 Strand Multi Shade Lilac Potato Shape Freshwater Pearls Approx. 7mm. 1 Strand Multi Shade Lilac Potato Shape Freshwater Pearls Approx. 7mm. Strand measures approx. 14 in..
FW-348, 1 Strand Gunmetal Rice Shape Freshwater Pearls approx. 7mm. FW-346, 1 Strand Lilac Oval Freshwater Pearls Approx. 7mm. 1 Strand Lilac Oval Freshwater Pearls Approx. 7mm. Strand measures approx. 14 inches. Grade B.Cultur..
FW-344, 1 Strand Gunmetal Rice Shape Freshwater Pearls approx. 7mm. 1 Strand Gunmetal Rice Shape Freshwater Pearls, approx. 7mm. Strand measures approx. 14 inches. Grad..
FW-341, 1 Strand Creamy Off White Almost Pale Peach 9mm Potato Shape Freshwater Pearls. 1 Strand Creamy Off White Almost Pale Peach 9mm Potato Shape Freshwater Pearls. Strand measures appr..
FW-339, 1 Strand Multi Pink Lilac Gold Potato Shape Freshwater Pearls Approx. 8mm. 1 Strand Multi Pink Lilac Gold Potato Shape Freshwater Pearls, Approx. 8 to 9mm. Strand measures app..
FW-355, 1 Strand Off White Rice Shape Freshwater Pearls Approx. 11mm. 1 Strand Off White Rice Shape Freshwater Pearls, Approx. 11mm. Strand measures approx. 14 inches. Gr..
FW-337, 1 Strand Multi Peacock Potato Shape Freshwater Pearls Approx. 7mm. 1 Strand Multi Peacock Potato Shape Freshwater Pearls, Approx. 7mm. Strand measures approx. 14 inche..
FW-353, 1 Strand Peach Rice Shape Freshwater Pearls approx. 10 mm. 1 Strand Peach Rice Shape Freshwater Pearls, approx. 10 mm. Strand measures approx. 14 inches. Grade..
FW-335, 1 Strand Pink Lilac Potato Shape Freshwater Pearls Approx. 7mm. 1 Strand Pink Lilac Potato Shape Freshwater Pearls, Approx. 7mm. Strand measures approx. 14 inches. ..
FW-351, 1 Strand Off White Rice Shape Freshwater Pearls Approx. 8mm. 1 Strand Off White Rice Shape Freshwater Pearls, Approx. 8mm. Strand measures approx. 14 inches. Gra..
FW-333, 1 Strand Multi Peacock Potato Shape Freshwater Pearls Approx. 6mm. 1 Strand Multi Peacock Potato Shape Freshwater Pearls, Approx. 6 to 7mm. Strand measures approx. 14 ..
FW-349, 1 Strand Peach Rice Shape Freshwater Pearls approx. 7 mm. 1 Strand Peach Rice Shape Freshwater Pearls, approx. 7 mm. Strand measures approx. 14 inches. Grade ..
FW-330, 1 Strand Peach Potato Shape Freshwater Pearls approx. 5 mm. 1 Strand Peach Potato Shape Freshwater Pearls, approx. 5 mm. Strand measures approx. 14 inches. Grad..
FW-347, 1 Strand Off White Rice Shape Freshwater Pearls Approx. 7mm. 1 Strand Off White Rice Shape Freshwater Pearls, Approx. 7mm. Strand measures approx. 14 inches. Gra..
FW-345, 1 Strand Peach Rice Shape Freshwater Pearls approx. 7 mm. FW-342, 1 Strand Gunmetal Rice Shape Freshwater Pearls approx. 6mm. 1 Strand Gunmetal Rice Shape Freshwater Pearls, approx. 6 to 7 mm. Strand measures approx. 14 inches..
FW-340, 1 Strand Off White Potato Shape Freshwater Pearls Approx. 10mm. 1 Strand Off White Potato Shape Freshwater Pearls, Approx. 10mm. Strand measures approx. 14 inches. 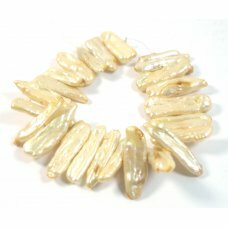 ..
1 Strand Off Whiite Rice Shape Freshwater Pearls, approx 10 to 11mm. Strand measures approx. 14 inch..
FW-338, 1 Strand Peach Potato Shape Freshwater Pearls approx. 7 mm. 1 Strand Peach Potato Shape Freshwater Pearls, approx. 7 mm. Strand measures approx. 14 inches. Grad..
FW-354, 1 Strand Pale Pink Lilac Rice Shape Freshwater Pearls Approx. 10mm. 1 Strand Pale Pink Lilac Rice Shape Freshwater Pearls Approx. 10mm. Strand measures approx. 14 inche..
FW-336, 1 Strand Off White Potato Shape Freshwater Pearls Approx. 7mm. 1 Strand Off White Potato Shape Freshwater Pearls, Approx. 7mm. Strand measures approx. 14 inches. G..
1 Strand Peach 'Rice' Shape Freshwater Pearls measururing approx. 7 x 5 mm, the strand mea..
1 Strand White/ Cream Oval approx. 6x5mm Freshwater Pearls the strand measures approx. 16 inches/ 40..
1 Strand Dark Grey Freshwater Pearls, measure approx. 5 mm. The strand measures appr..
1 Strand Peach Roundish Freshwater Pearls these pearls measure approx. 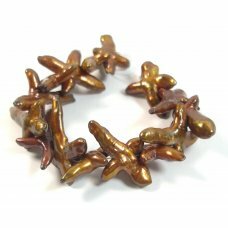 5mm and the strand measures a..
1 Strand Coppery Keishi Freshwater Pearls lovely lustre and sheen these pearls measure approx. 10 x ..
1 Strand Pale Shades Double Drilled Freshwater Pearls a mixture of pink peach and cream/ white these..
1 Strand Top Drilled Delicate Peachy Pink Biwa Stock Pearls with a lovely glow these pearls are grea..
1 Strand Yellow Gold Freshwater Pearls oval(ish) pearls which measure approx. 6x5 mm the strand meas..
1 Strand Coppery Large Roundish Freshwater Pearls nice autumnal metallic colour these pearls measure..
1 Strand Beautiful Purple Peacock Oval Freshwater Pearls fab unusual colour these measure approx. 8x..
1 Strand Creamy White Button Shape Freshwater Pearls measure approx. 7 x 4 mm (some larger or smalle..
1 Strand Creamy White Irregular Freshwater Pearls try putting these with peachy coral and gold for a..
1 Strand Cream Rice Freshwater Pearls, attractive cream colour oval(ish) shape pearls which measure ..
1 Strand Peach Rice Shape Freshwater Pearls measure approx. 6.5x5mm (some larger some smaller) and t..
1 Strand 'Autumn Leaf' Shade Potato Shape Freshwater Pearls, a coppery/golden/autumnal col..
1 Strand Pink Oval Freshwater Pearls measure approx. 7x6mm (some larger some smaller) the strand mea..
1 Strand Peach Baroque Freshwater Pearls; large pearls with a random shape measururing&nbs..